October was an awesome reading month for me. 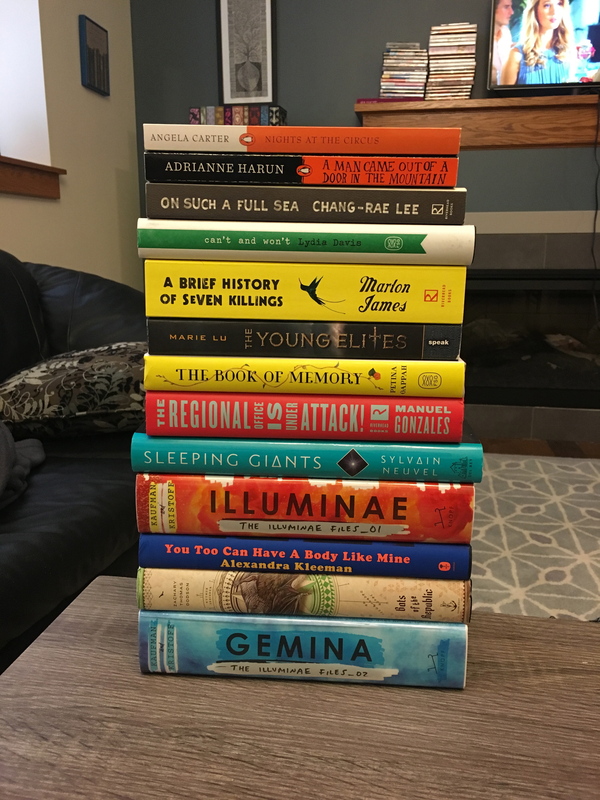 The last few months haven’t been great (I didn’t read good books in August, and in September I read good books but very few of them), so I was really relieved to have a month of great books and lots of reading. I participated in the Dewey’s 24-Hour Readathon, which was wonderful; read a total of 3 books with a significant focus on artificial intelligence, which was a total coincidence; and participated in a Halloween-themed reading challenge for which I read 4 books. I also read an absolutely enchanting 5-star book and discovered a few new authors that I’ll definitely be reading more from in the future. The Long Way to a Small, Angry Planet by Becky Chambers (5 stars) – this is the perfect example of a book that lives up to all of its hype and yet still manages to surprise you. It’s a shockingly positive, daringly upbeat science fiction novel focused on character development and the interactions between seemingly disparate societies, and I LOVED IT. I want to pick up the sequel very soon. The Vegetarian by Han Kang (4 stars) – I thought the writing was really beautiful, and this was dark and immersive. The multiple perspectives worked well for me, as each one takes you deeper into the story. I really liked it but didn’t love it. The Beautiful Bureaucrat by Helen Phillips (4 stars) – this was a short, unsettling novel about a woman who takes a dull office job entering data into a database and finds her reality slowly start to unravel. The weirdness was great for October, and it’s one that I’d recommend. The Daylight Gate by Jeanette Winterson (4 stars) – this was a disturbing, starkly written historical fiction/fantasy about the famous witch trials that took place in Lancashire in the 1600s. It wasn’t a subject that I had prior knowledge of, but Winterson includes a brief historical note before and after the story that helps to orient people like me. The book’s main character is Alice Nutter, a beautiful, mysterious, independent bisexual woman living in an era completely pervaded by misogyny and religious persecution. As a witch hunt begins to take place in her present, we begin to learn about her fascinating backstory. It’s a really brilliant and impactful book, and I’d highly recommend it–but I’d add the caveat that there is a lot of sexual violence and torture throughout the book, so if that’s something you typically have a hard time with, steer clear. 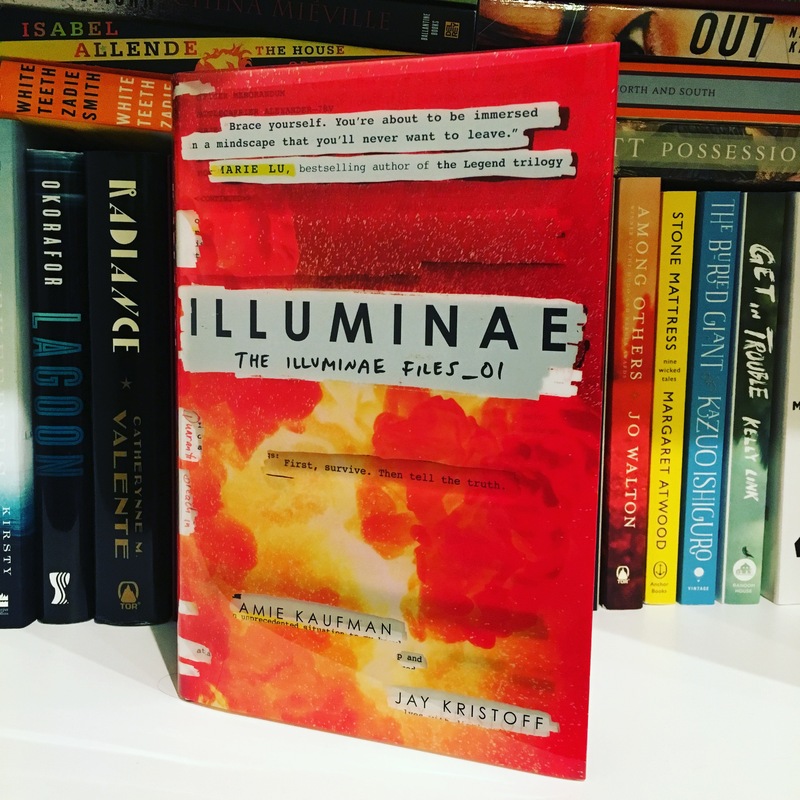 Illuminae by Jay Kristoff and Amie Kaufman (4 stars) – I read this for Dewey’s after procrastinating it for awhile; it’s a book that’s just so popular all over Bookstagram and the blogs that I got tired of seeing its cover. Turns out that I was wrong and everybody else was right, because I thouroughly enjoyed it. 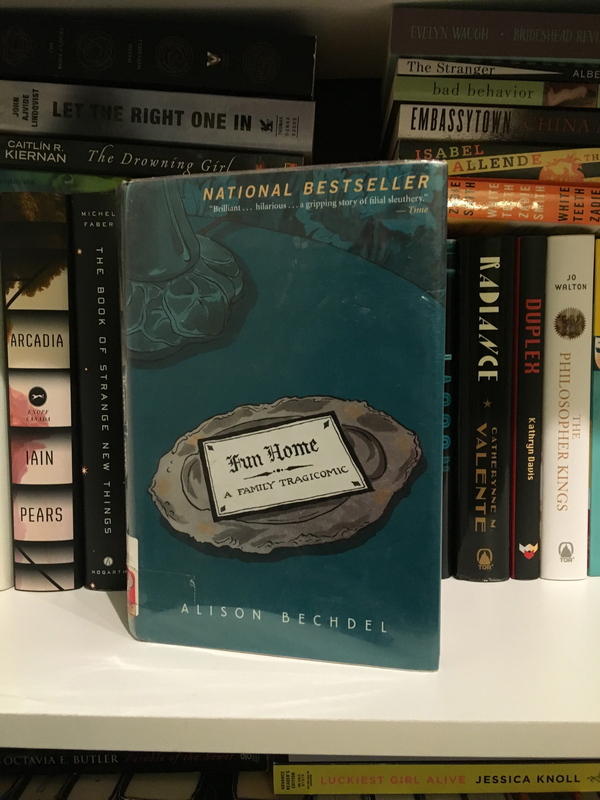 Fun Home by Alison Bechdel (4 stars) – this graphic memoir, which focuses on Bechdel’s relationship with her father and learning about her sexuality, was insightful, emotional, and I’d highly recommend it. 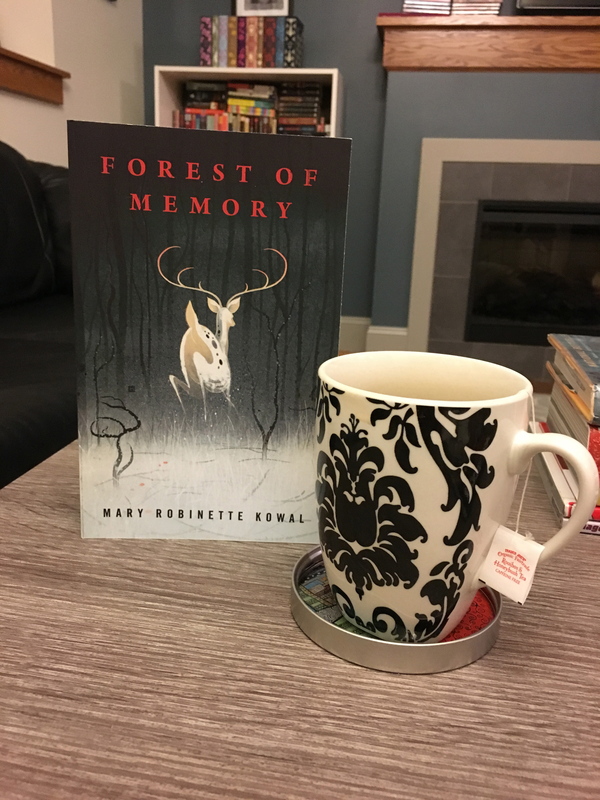 Forest of Memory by Mary Robinette Kowal (3.75 stars) – this was a short novella set in the near future where everyone has a personal AI that sort of acts like a google inside their heads was a perfect pick for Dewey’s. The story starts when our main character, a dealer in antiques (which are basically modern-day objects, although some are older) is abducted by a man in the woods and finds herself without an AI and completely out of contact with the world. There is also something mysterious going on with deer. I don’t want to say more because it’s quite short, but you should pick it up. 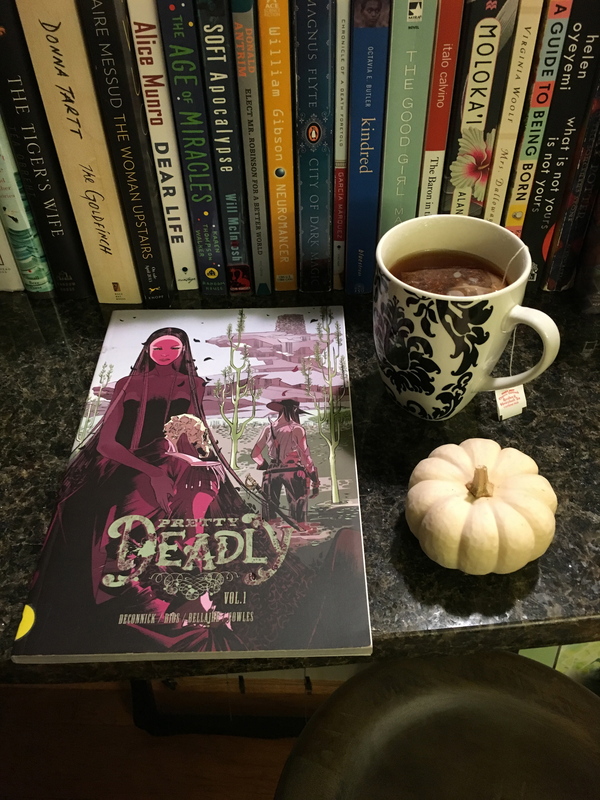 Pretty Deadly, Vol 1 by Kelly Sue DeConnick and Emma Rios (2 stars) – Sorry, Pretty Deadly, but I am just not on board. For me, this graphic novel was too bloody and never took the time to establish any characterization. The mythology could have been interesting, but just wasn’t in the way the story was told. I won’t be picking up the next volume. Audiobooks! I’m not going to lie, I crushed it with audiobooks this month. Four audiobooks is a lot for me, and the great thing was that I was really absorbed in most of these. I decided to rank these separately, for some reason. In a Dark, Dark Wood by Ruth Ware (4 stars) – this was a really pleasant surprise for me. I don’t read a lot of mystery/thriller books, but Ware does a fantastic job with characterization and I was immediately drawn in to the atmosphere of this story. Essentially, an introverted author is invited to the bachelorette weekend of an old childhood friend she hasn’t spoken to in years, and things begin to get creepy from there. My favorite character was Nina, the bitingly sarcastic doctor friend of the book’s main character. The Geek Feminist Revolution by Kameron Hurley (3.5 stars) – this book of essays was interesting and insightful, but the audiobook narrator was TERRIBLE. I would absolutely recommend the book itself, but I’d really advise people to steer clear of the audio version–the narrator sort of overly-pronounces words and seems like she’s trying to sound super proper, but she somehow still manages to mispronounce a lot of things. It’s very odd; I kept going because the essays were so interesting, but I persisted in spite of the audio narrator. Furiously Happy by Jenny Lawson (3.25 stars) – at turns entertaining and insightful, and a really good listen on audio. Bird Box by Josh Malerman (2.5 stars) – I really liked the science fiction/horror concept of this book, which was why I didn’t give it a lower rating. The problem for me was characterization, and this is a big deal for me in books–if the characterization is flat, then it doesn’t really matter how many twists and turns there are in the plot, it just isn’t going to be a great book for me. So that’s what I read in October! How did everyone else’s reading month go? 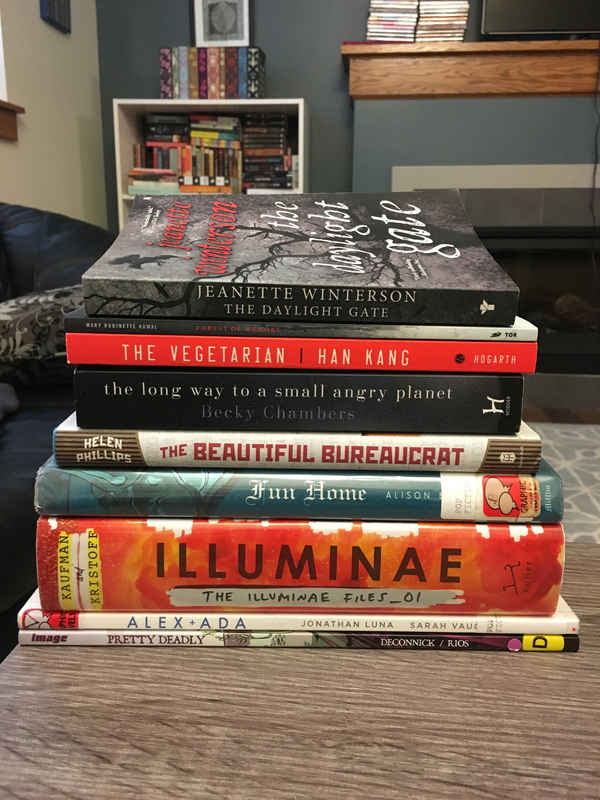 I may or may not have gotten caught up in the sales on Book Outlet during October, which convinced me to pick up more books than I meant to…I’ll try to do better in November! Nights at the Circus by Angela Carter – I hate to say that I wasn’t in love with Carter’s short story collection The Bloody Chamber; I really liked the first two stories but felt it got repetitive from there. I really wanted to give Angela Carter another shot, though, since she’s such a well-renowned author, and this book about a circus performer who claims to be part-human, part-swan sounds really intriguing. Lots of books about bird people coming up this month, apparently. The Book of Memory by Petina Gappah – this book about an albino woman imprisoned in Zimbabwe after being convicted of murdering her adopted father sounds fascinating, and I’m assuming it also deals with the unreliability of memory, something I always like in fiction. The Regional Office is Under Attack! by Manuel Gonzales – this sounds like a really fun, action-packed book about female assassins, and I’ve heard good things so far. Sleeping Giants by Sylvain Neuvel – I haven’t been hearing great things about this book in reviews, but I somehow feel that I will like it. Sometimes I like really unpopular books (and vice versa, actually probably more frequently I hate really popular books) so I wanted to give this one a try. It’s about a mysterious (alien?) artifact found by a young girl who grows up to be a physicist studying where the object could have come from. It’s getting comparisons to World War Z, which I’ve never read, but I hope that doesn’t mean there are zombies because I HATE THEM. Vampires, yes. Werewolves, yes. Aliens, yes. Fairies, sure. But zombies? No thanks. 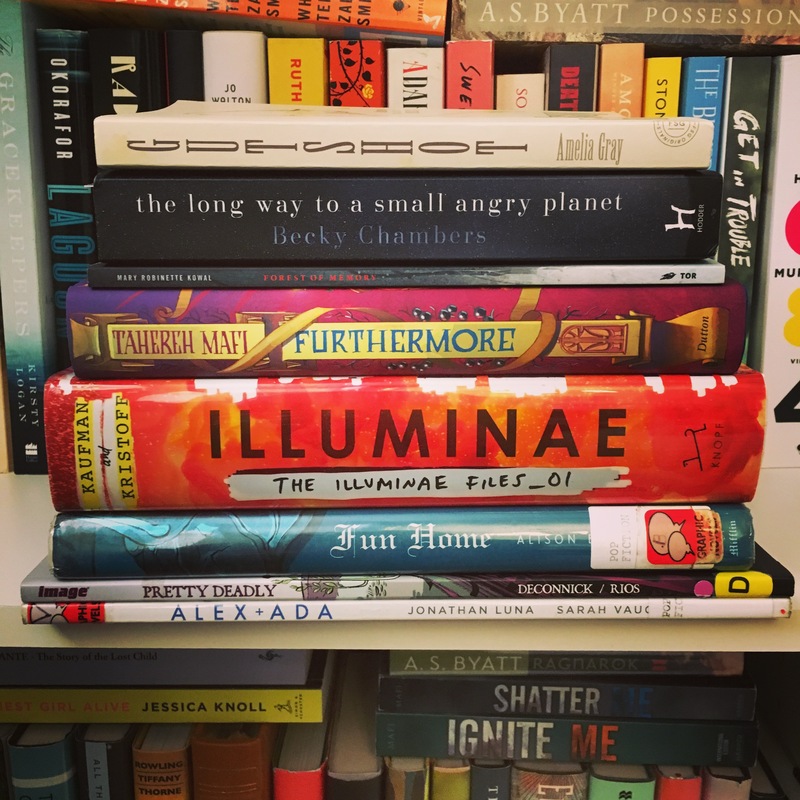 Iluminae and Gemina by Jay Kristoff and Amy Kaufman – I enjoyed reading Illuminae so much during Dewey’s 24-hour readathon that I immediately bought its sequel after I finished it. The main characters in Gemina shift to two teenagers living on the space station mentioned in the first book, which I’m okay with–not that I didn’t like the main characters in Illuminae, but they weren’t the reason that I enjoyed the book. I’d ideally like to wait and save Gemina for the next readathon (24 in 48 and Bout of Books are both in January) but I’m not sure if I’ll be able to wait that long. The Young Elites by Marie Lu – I’ve heard that this YA novel has a really great female antihero as its main character, and that it’s dark fantasy, which I tend to enjoy. I haven’t found a really good YA trilogy in awhile, and since the last book just came out, it seemed like good timing to pick this one up. Bats of the Republic by Zachary Thomas Dodson – this book sounds SO COOL. It’s a nontraditional format with illustrations and documents as part of the story, and is told through dual narratives, one in 1843 and one in a dystopian future. I honestly don’t even want to know any details so that I can discover them for myself; the book also includes a letter labeled “DO NOT OPEN.” Can’t wait to ignore that and open it. You Too Can Have a Body Like Mine by Alexandra Kleeman – I’ve heard really good things about this book, whose characters are named only A, B, and C. I believe it’s sort of a darkly funny look at consumerist culture, but I could be totally wrong on that. A Man Came Out of a Door in the Mountain by Adrianne Harun – I’m going to let the Goodreads page take this one: “In isolated British Columbia, girls, mostly native, are vanishing from the sides of a notorious highway. Leo Kreutzer and his four friends are barely touched by these disappearances—until a series of mysterious and troublesome outsiders come to town. Then it seems as if the devil himself has appeared among them.” Apparently magical realism is also involved. This one doesn’t have many reviews up, but I’m feeling really drawn to the story. On Such a Full Sea by Chang-Rae Lee – this dystopian science fiction book set in future America was really highly recommended; I’ve had my eye on it since it came out in 2014 but was waiting for the paperback. That’s a wrap on Dewey’s! I had such a great time reading and engaging in bookish awesomeness yesterday. The readathon came at a really perfect time, and it was so relaxing to abandon adulting for the day and read as much as possible instead. I joined a bit late, which I was prepared for, and ended up reading until about 4 a.m., which I was not anticipating doing. I started off with a graphic novel to kick things off, then got completely immersed in a YA scifi thriller (Illuminae) for the majority of the first half of the readathon. I thought I might get burnt out on reading by the end of the ‘thon, so I took a break to work out, shower, and eat dinner (delicious takeout Thai curry), which actually helped me get a second wind. I then jumped into a longer graphic memoir for awhile and picked up another graphic novel after that. Around 2 a.m. I was considering going to bed, but pushed myself to read one more short book, which turned into doing a little audiobooking as well, which then turned into me picking up my current read, so I ended up finishing strong. 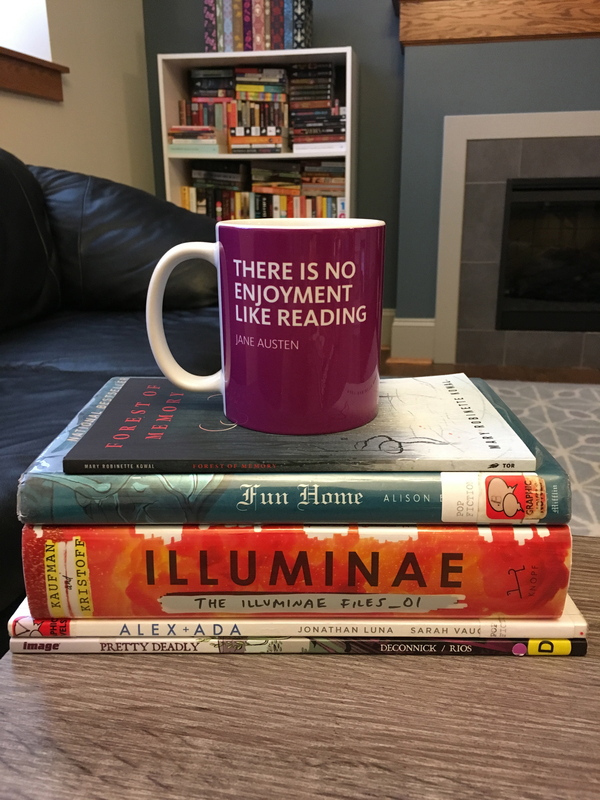 Overall, I actually did way better than I thought I would–I don’t set a timer or anything, but I think this readathon was a personal best in terms of both how much time I spent reading and how much I actually read. Yes! I think that Illuminae by Amie Kaufman and Jay Kristoff was a great readathon book because it was so fast-paced and told in an unconventional format. I’d also recommend Fun Home by Alison Bechdel, Every Heart a Doorway by Seanan McGuire, Texts from Jane Eyre by Mallory Ortberg, Forest of Memory by May Robinette Kowal, Carry On by Rainbow Rowell, Milk and Honey by Rupi Kaur, Confessions by Kanae Minato, Binti by Nnedi Okorafor, and any of Ilona Andrews’s books. No, I thought it was fantastic. I read 5 books for a total of 1167 pages–3 graphic novels, 1 novella, and 1 YA novel. I also listened to about half an hour of my audiobook (The Geek Feminist Revolution by Kameron Hurley) and read about 16 pages of my current book, The Long Way to a Small Angry Planet by Becky Chambers. Illuminae was definitely the highlight of the readathon for me; it was such an action-packed, fast-paced book which worked perfectly to keep me engaged during the readathon. It’s a science fiction novel about the aftermath of an attack on a small planet and how the survivors are attempting to escape and not succumb to about a million different threats and conspiracies on the way. Unfortunately, Pretty Deadly really did not work for me. I didn’t like the artwork, and I was not engaged in the story. There were some interesting aspects to it, but not enough to keep me going with this series. I’ll definitely be participating next time! I love this readathon and highly recommend giving it a try to anyone who’s been hesitant. How was everyone’s readathon??? Feel free to link me to your posts, I would love to hear how you all did! It’s hour 12 of Dewey’s, and I’m really surprised at how well I’m doing so far. I was able to join in on the fun earlier than anticipated, and have spent almost the entire day reading! I’m sort of in between books right now! I just finished Illuminae and it was awesome, and I’m sort of bewildered as far as where to go from here. I still have a bunch of books in my stack, and I’m thinking I’ll probably go for a graphic novel next–possibly Pretty Deadly, Vol 1. Technically I am in the middle of my audiobook, The Geek Feminist Revolution, but I haven’t listened to very much of it during the readathon so far. 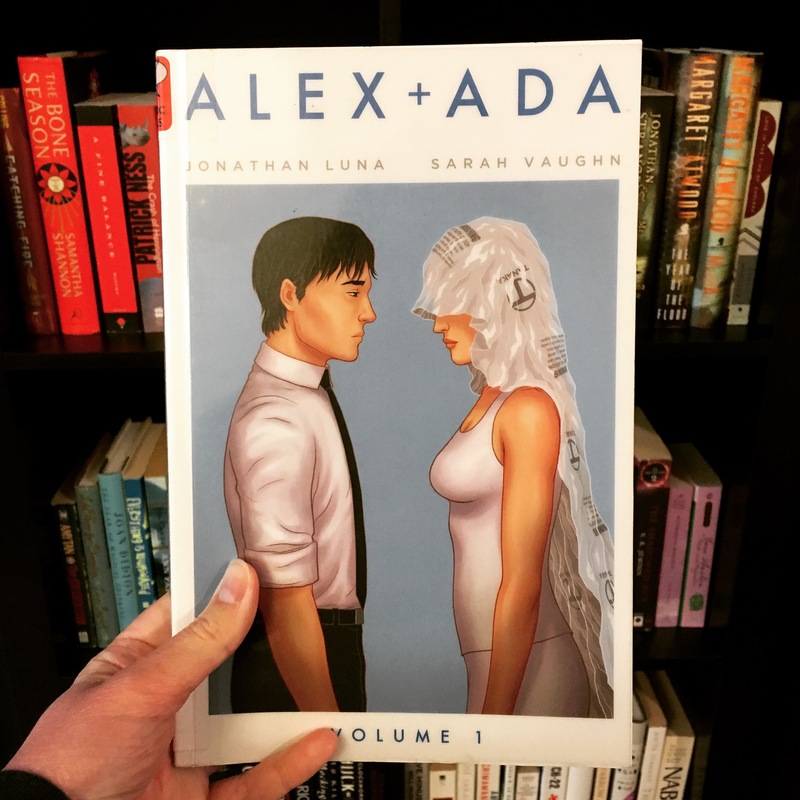 So far I’ve finished 2 books–Alex + Ada, Volume 1 by Jonathan Luna and Sarah Vaughn and Illuminae by Jay Kristoff and Amie Kaufman. Both were really great picks for the readathon, and I definitely recommend them. Hmmmm…I’m very interested to see what Forest of Memory by Mary Robinette Kowal is all about, and it’s a novella so it’s easily finishable by the end of the ‘thon. I’ve done pretty well with not having interruptions so far–I was too caught up in Illuminae to get distracted. I did just take a break to work out and shower, but I think that will help refresh me for the second half of the readathon. I’m most surprised by the fact that I won a prize! I was actually one of the Hour 1 prize winners, and it was a really awesome surprise to see my name on there when I was able to join in on the readathon late this morning. I typically have terrible luck with giveaways and never win prizes, so thank you, Dewey’s!!! I hope everyone is having a fantastic readathon so far!